The mussar movement is some 200 years old. It was developed in Lithuania to defend the Lithuanian Jews from the so called "Enlightenment Movement." Its stated purpose is to instruct ethical and spiritual discipline. Most Jews today who teach and practice mussar stress the correction aspects of mussar being quick to point out what is wrong. The intention is to improve oneself, or most often someone else, by pointing out their mistakes. Oy! The truth is I am allergic to mussar. It's not because mussar is wrong, but because it seems that the ones who are giving it are focusing only on the negative. The other day Tzvi Freeman, a senior editor and writer for Chabad.org, stopped by the tefillin stand at the Kotel. At first I didn't recognize him but as soon as I did I opened up on him. "Tzvi, I am so glad to see you. I want to tell you about your writings." I could see him bracing for the onslaught. "Your writings are great. They are really good. You get to the point, you answer the questions, you don't give in, but all the time you are nice and friendly. You don't speak down to the reader. You are doing a really great job." He looked at me and said, "I was expecting mussar." I said, "That was mussar." Mussar is intended to improve someone's service to Hashem. Pointing out what's wrong is not the only way to improve someone. It is even better to strengthen the good they do. This improves their service to Hashem more than just saying what you think they are doing wrong. When I first visited a yeshiva many years ago it was a Litvak yeshiva. 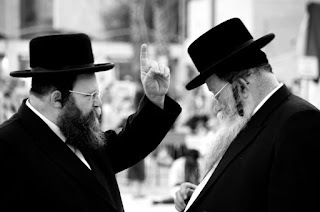 Mussar is their "spiritual" technique. Every Thursday night they would divide into groups of five students to a table, put a bottle of coke cola on the table, and take turns telling each other the things that they did not like about each other. Not to be mean, G-d forbid, but just to do each other a favor by showing them what they had to correct. Mussar! Then I visited a Chasidic yeshiva and they did the same thing, well almost. Every Thursday night they divided into groups of five students to a table, put bottle of vodka on the table, and take turns telling each other the things that they did like about each other. Chassidus! I always had a place in my heart for Chassidus. You can improve the world by stressing the good things. You not have to stress what's wrong. Then it not only makes the world a better place, it feels good when you do it. Why not make use of both mussar and chassidus? After all, it's one encompassing passuk: "sur mera va asse tov" and we can't ignore what is wrong while stressing the good and vice versa right? Rav Kook was of both mitnagged and chassidic ascent, and look what was his life about: bringing Jews to their land. When you unite both movements, one word, Geula!